At the end of the 18th century, the first kind of papermoney appeared in the Netherlands Indies. 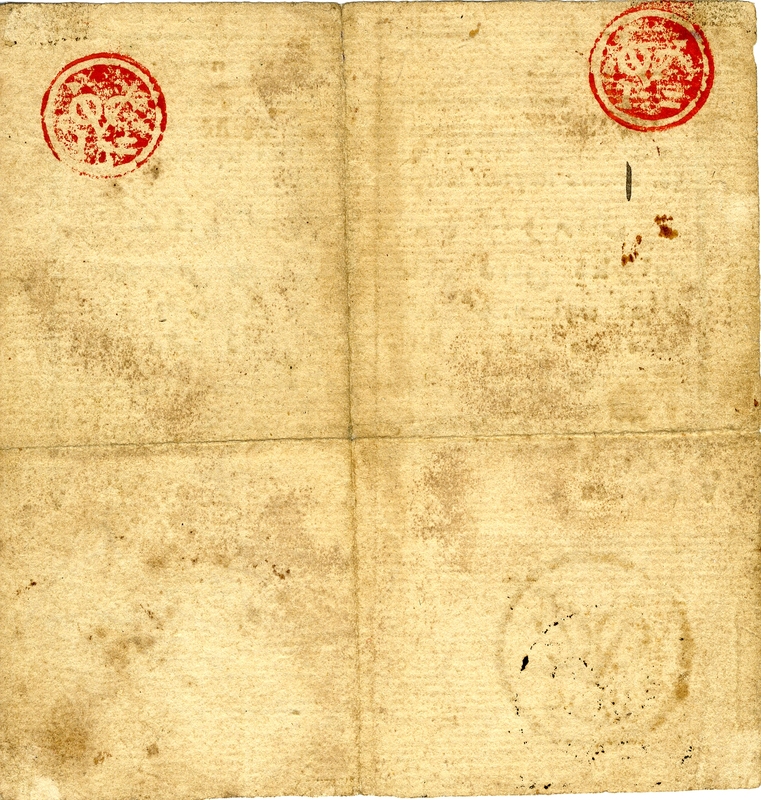 The notes were issued by the Dutch East India Company (VOC) that represented the Dutch interests in the East. Many money transports from the Netherlands got lost and the wars with England twarted these transports regularly. Also the political uncertainty in Europe due to the French revolution and the war between France and England, resulting in the occupation by the English of the Dutch possessions in the East and West, bothered the VOC substantially. As a consequence, the decay of the VOC started in the second half of the 18th century. The subsequent scarcity of money and the shortage of precious metals for coinage, led to the issuing of papermoney in 1782. The notes were issued in a period during which France also re-introduced papermoney and a number of other European countries also started using papermoney, like Sweden, Denmark and England. Initially interest bearing bonds were issued (6%) in denomiations of 25, 50, 100, 200, 300, 400, 500 en 1000 rijksdaalders. In 1873 the interest was not applied anymore. The notes were issued in multiples of rijksdaalders, starting from 1 up to 1000 rijksdaalders. 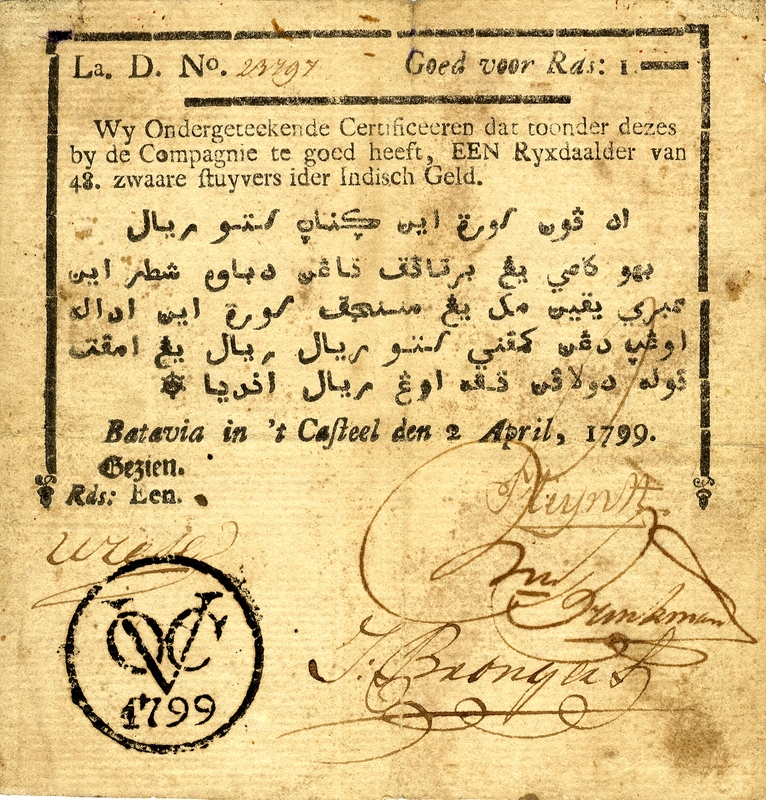 The exchange rate of these credit notes and the exchange against cash was problematic due to the impoverished situation of the VOC and resulted in substantial depreciation and the notes being sold at exchange rates lower than 15%. Just before the VOC got bankrupt in 1799, the Netherlands Indies government issued new emissions, even during the French occupation (in the name of King Lodewijk Napoleon) and the English occupation (in the name of the English East India Company EEIC)) until approximately 1810. Example of this first papermoney, a rijksdaalder from 1799, good for 48 zwaare stuyvers Indish money, issued in t’ Casteel (the Castle) in Batavia. The notes carry authenticity marks with VOC stamps on obverse and reverse, on handmade paper and has signatures by Brongers, Brinkman and Kleijnst(?). This extremely rare note was for sale in the auction of Collectplaza International Auctions (http://collectplaza-auctions.com/auction/index.php?product=13395) on May 30, 2010. Bidding started at 28.000 Euro. The note was not sold.